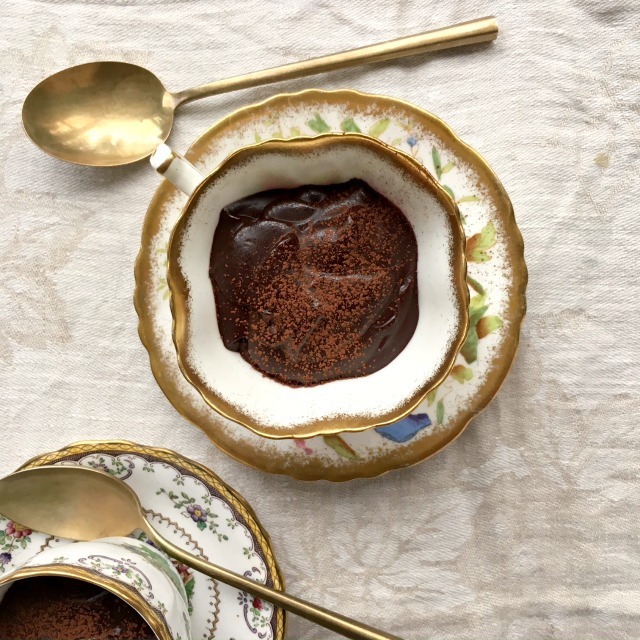 5-minute blender chocolate pots are similar to a chocolate pudding only denser. They have a rich, intense chocolate flavour and a creamy texture. I grew up in a home where dessert was on the menu every night. We ate a lot of puddings and custards and to this day I have a weakness for creamy chocolate and butterscotch desserts. I’m sure it was memories from my childhood that drew me to this recipe for blender chocolate pots. 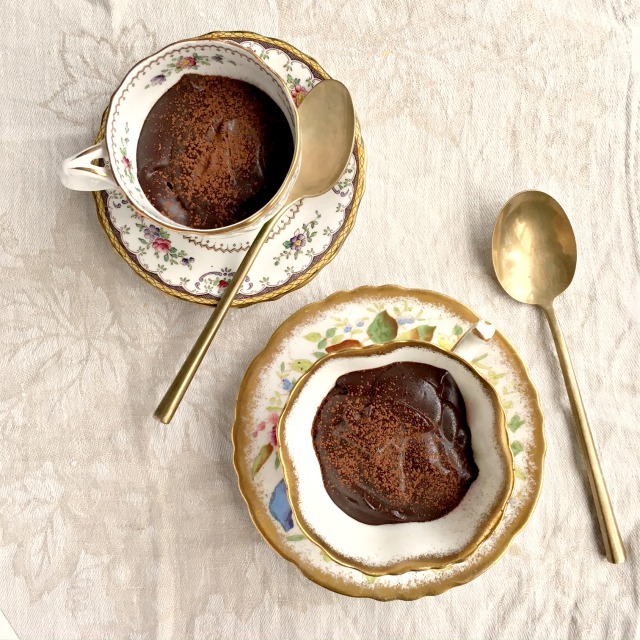 Similar to a pudding only denser, these chocolate pots have a rich, intense chocolate flavour and a creamy texture. This recipe is super easy and really does just take five minutes to prepare.  It can be eaten right off the bat as well (no need to let it set in the fridge, if you don’t want). Adding a little molasses to chocolate desserts helps to intensify the chocolate flavour. This is a very rich dessert so a little goes a long way. Serve with crispy cookies or biscuits alongside. 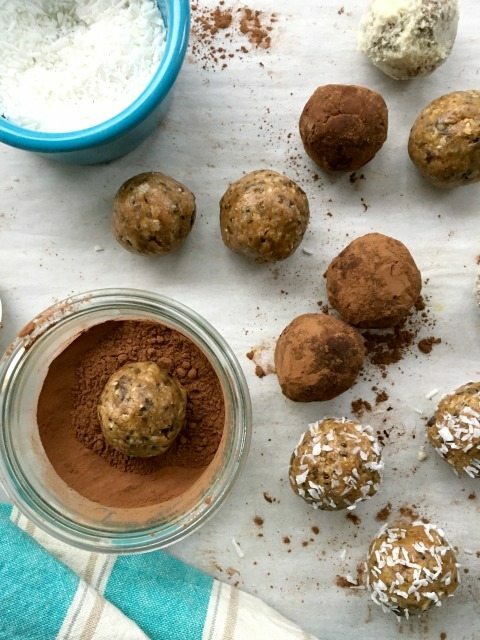 You can make this recipe with bittersweet chocolate chips. If you don’t have a kitchen scale to weigh the chips, 6 oz is a scant cup of chocolate chips. The mixture is also delicious poured into mini pre-baked tart shells. You can also pour the mixture into a lined loaf pan (small). Once the mixture has set it can be sliced and served in slabs with whipped cream and raspberries. 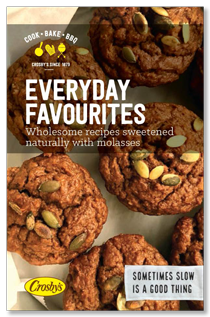 The recipe is an adaptation of a recipe from The Café Sucre Farine, a terrific blog filled with wonderful, well-tested recipes. I often find inspiration on their site and I bet you will too. This recipe is made in the blender. Everything but the cream is first chopped in the blender and then hot cream is added to that mixture. The cream cooks the egg and melts the chocolate. Voila! 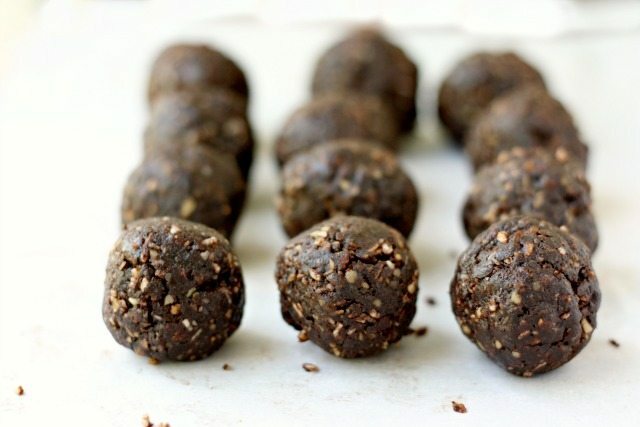 Combine chocolate, sugar, molasses, egg, vanilla and sea salt in a blender or food processor. Pulse a few times to chop. Pour cream into a medium pot and bring to a boil over medium heat. Turn blender on low and pour in hot cream, while the machine is running (using a funnel, if necessary). Cover tightly and blend on high until mixture is smooth and silky. Pour into cups and chill for an hour. 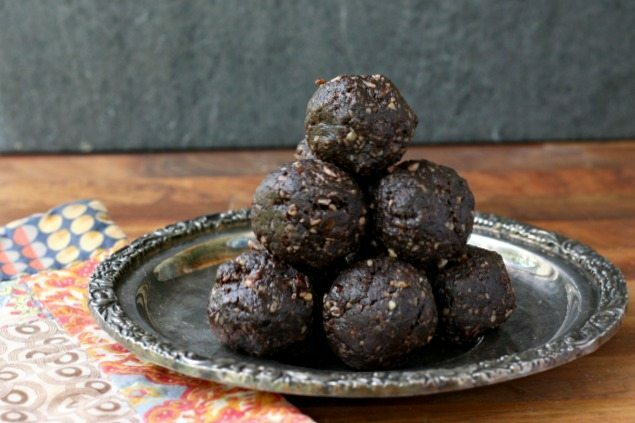 Remove from fridge at least 30 min before serving, sprinkled with a little cocoa powder. 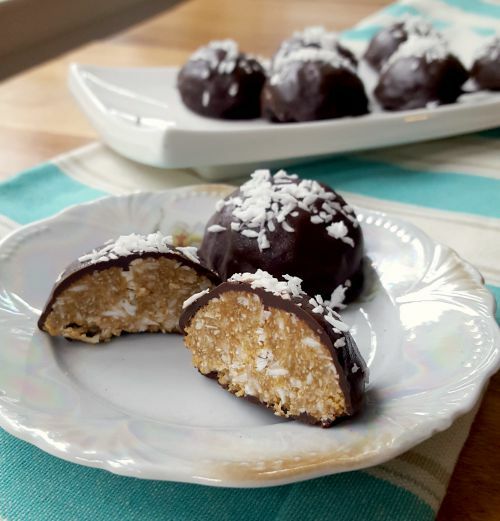 Sometimes all you need is a little nibble of something sweet to satisfy a craving and these Coconut Mounds seem to do the trick. They’re really part energy bar, part chocolate bar, so let me give into my sweet tooth without feeling like I have been eating junk. 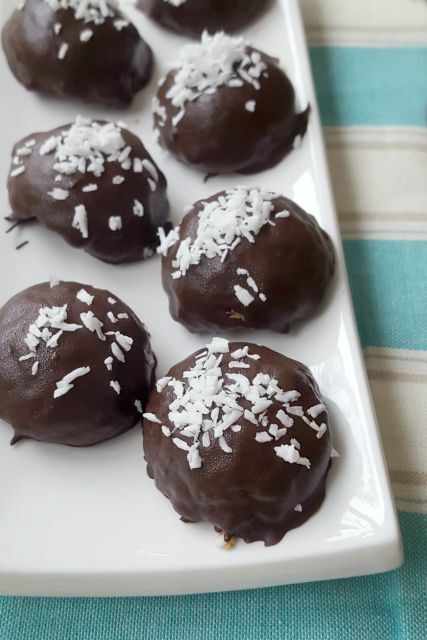 Coconut balls usually call for sweetened coconut and lots of icing sugar. 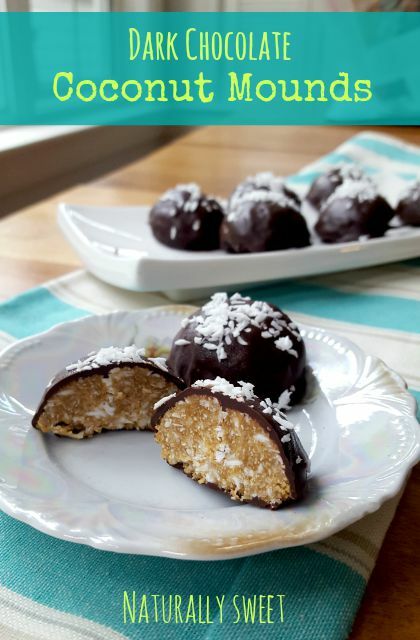 This naturally sweetened version reduces the sugar by more than half by using unsweetened coconut and just a bit of molasses and honey to sweeten and bind the coconut. A little coconut oil is essential to holding it all together since it firms up well. I use 72% chocolate as a coating. It’s slightly bitter so a nice balance for the coconut. If you prefer something sweeter you can go with melted chocolate chips. 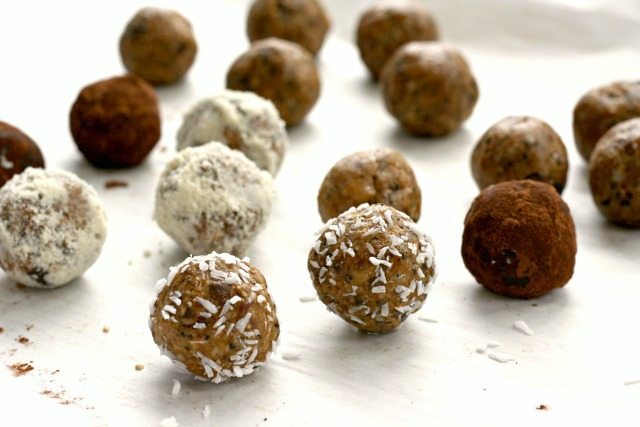 It takes less than 10 minutes to mix and shape these coconut mounds and then they sit in the fridge for about 30 minutes to firm up. You can get the dipping chocolate set while they’re chilling. Pulse the coconut in a blender or food processor a few times so it looks a bit like almond flour. In a medium bowl whisk the melted coconut oil with the molasses, honey, vanilla and salt. Scrape coconut into the bowl with the oil mixture. Stir until well combined. Refrigerate for 30 minutes or until you have time to do the chocolate dipping. Melt the chocolate slowly in a double boiler. Drop each mound into the melted chocolate, flip to coat and remove with a large fork. Place on the cookie sheet flat side down. 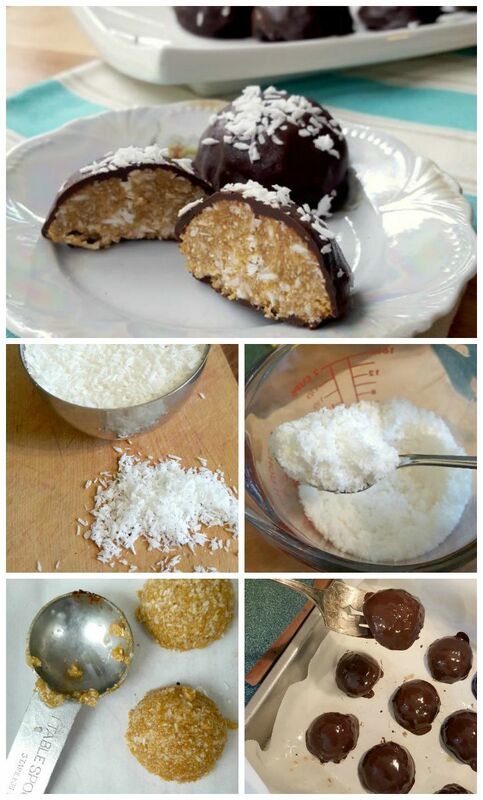 Sprinkle over some coconut and refrigerate until chocolate has hardened.